Christopher (Chris) S. Kilham, born July 22 1952, is a teacher of yoga, meditation, and natural health, an author, medicine hunter, educator and world-traveler, and is a Fox News alternative medicine presenter and columnist. He has conducted medicinal research across 5 continents and in the South Pacific, and has been described as a cross between Indiana Jones and British TV personality David Attenborough. 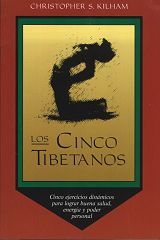 He has authored many articles and 14 books, including The Five Tibetans. He lives in Leverett, Massachusetts.